We had our first snowfall over the weekend and I am ecstatic! The best part about the snow was taking baby Khush out for his first time! He absolutely loved it. He was stuffing his nose right in and kept trying to eat it. It was so cute! I think J and I are going to have to get him some booties for his little paws though. Don’t want them to freeze! Gah, so with the weather officially cold, all I am craving is rib sticking food. Risotto, stews, soups and of course, hearty curries. Per the usual, I am making this Monday a meatless one. I do like to eat meat, but for some reason most of the recipes I share are vegetarian. If there is a meat dish you have questions about or would like to see me make, just let me know and I am happy to recipe test! 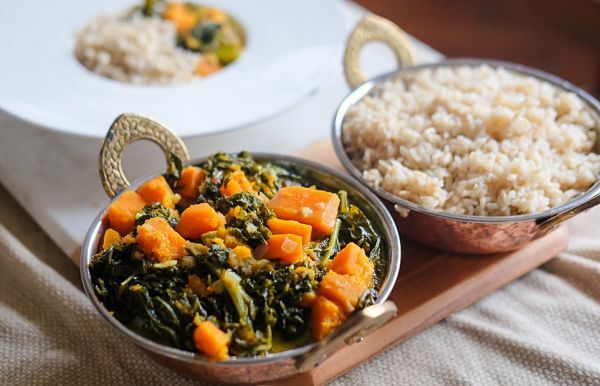 This week I am sharing my Butternut Squash and Kale Curry. This curry is perfect for the lazy currier. Currier? Making up new words here. Curries, usually take a hefty amount of work and time. It is all about layering flavors and letting them build. 9/10 times I make my curry from scratch, blending from different spices, and adding as I go to create a layering effect of taste. This time I cheated and used curry powder…ssshhh…don’t tell! I have to be honest…. using a pre-made set of spices just doesn’t do it for me. There was a noticeable difference in taste to me. Since the curry powder eliminates the need to add different spices at various times during the cooking process, I felt like I didn’t achieve that true, authentic, Indian flavor. I realize I am knit picking and most people don’t have the time to make a labor-intensive curry. Regardless, the curry was still delicious, filling and perfect for a cold day + it makes lots of leftovers! This curry has a base of coconut milk, which the kale is braised down in and a little lime in at the end for a slight tang. Serve over a bed of brown rice or yummy roti or naan. 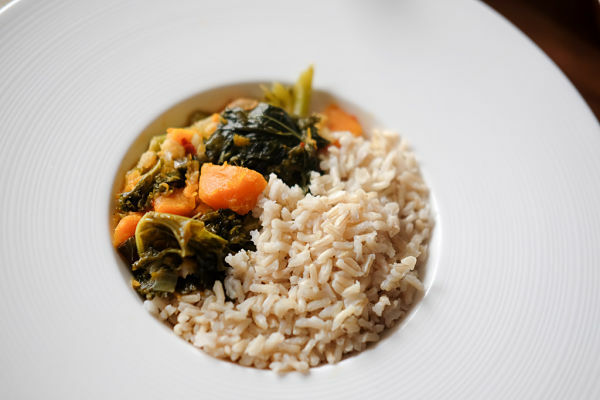 Hearty braised coconut kale with butternut squash for a spicy and warm wintertime meal! Heat 2 tbsp. oil in a pan over medium heat. Add onions stirring frequently, until softened, about 5 minutes. Add squash, cover and cook, stirring occasionally, until the squash begins to brown, about 5 minutes. Transfer the mixture to a bowl. Add 1 tbsp. oil back into the pot over medium-high heat. Add garlic, ginger and curry powder. Stir and cook until fragrant, about 30 seconds. Add half of the kale and stir until it’s beginning to wilt. Stir in the remaining kale and add the broth, ½ the can of coconut milk, salt and red pepper flakes. Cover pot and reduce heat to medium low. Cook, stirring occasionally, until kale is wilted, about 12 to 15 minutes. Add in butternut squash mixture, cover and continue to cook until kale and or squash are tender, 10 to 20 minutes. Once the kale and butternut squash are tender, uncover and increase heat to medium-high. Cook, stirring occasionally, until most of the liquid has evaporated and sauce has thickened, 2 to 5 minutes. Remove from heat and stir in the remaining coconut milk. Add fresh lime juice and season with salt and red pepper flakes, to taste. Serve warm over rice or with bread! That looks delicious! Also, how do you get recipes to post like that? Also interested on how you got your recipes to post like that! 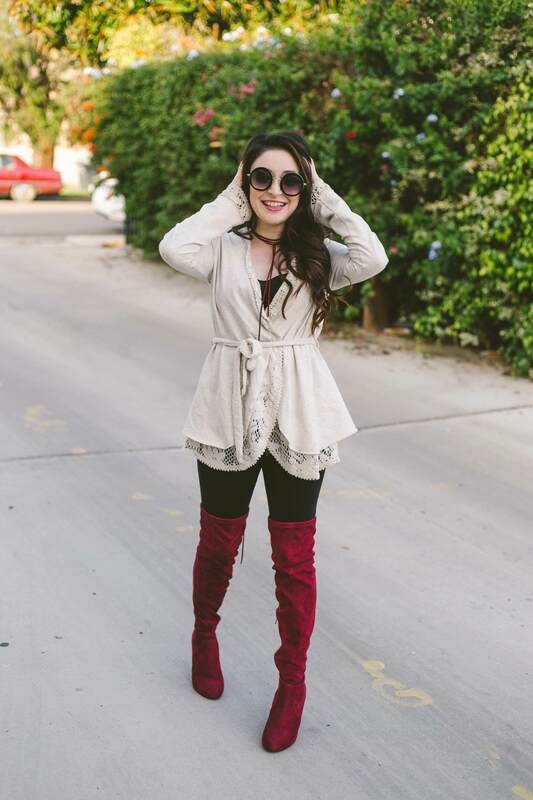 Looks so pretty laid out on the blog. Not that I personally post a ton of recipes on mine, it’s just really beautiful! It’s the WP Recipe plugin! That looks delicious! How do you get your recipes to post like that? It’s a plugin! It’s called WP Recipe Builder. I bet, people never know how to drive hehe. I also love to make my curries from scratch. I actually have quite a large collection of spices brought from my trips to India. I love those layers of flavors that you can’t get from a pack. I have never tried a butternut squash curry before. It sounds interesting (made from scratch though 🙂 ). You should post some recipes! Looks like you have traveled literally EVERYWHERE! Yum! This looks so good! I love anything with kale in it, so I’ll definitely have to try out this recipe!! Gosh! That looks delicious. I have not tried adding Kale to a curry … that would be such a good addition. Thanks for the tip. p.s. Love the pictures too. Um. That looks SO Delicious! As a vegetarian family, I could see this be a staple meal! This looks fabulous! It’s the perfect winter dish. The greens and the oranges just beckon to be tasted. Kale is the bestest. Looks so delish. I will be making this soon. Lol you are too funny about cheating with curry powder. Well this way I can make it now haha! Looks delish lovely! That looks really delicious and really nutritious! I want to try this before the year ends. Ooh delicious, that looks so warming and exactly what I need on a -3 celsius day like today! This looks refreshing and yummy! I love to try it out, thanks for all the tips. You are an amazing cook! Kale is hard for me to love. You really make this sound delicious! Food photos are hard and you made them look great! THank you for showing love to kale. KAle is so underrated, but I love it so much. I can’t wait to give this recipe a try. I do really love seeing and to try a delicious and tempting recipe like this. I will absolutely give it a try before New Year’s Eve. I am sure that my family l=will love this so much. This looks like a good way to use kale. I’m not a fan of kale but I’m always open to new ways of trying it, if it tastes better. I would definitely explore this recipe further. Is the taste of coconut really potent? Because I don’t like it very much and if yes, what can I use instead? It really isn’t that potent. You can sub with whole milk if you like! This looks delicious and exactly what I feel like on such a cold night! I’d love to try this, like.. now! I was just thinking “Yay! I have everything I need to make this” and then realized I don’t have a butternut squash. Maybe I’ll try it with sweet potato this week. Sounds good! omg! it would be realllly good with sweet potato! This looks so tasty and healthy for you. I might have to get this a try. This looks so tasty, I would love to try it. I have been wanting to find new meals to try and this might just be the one. looks so yummy! will have to give making this one a go! 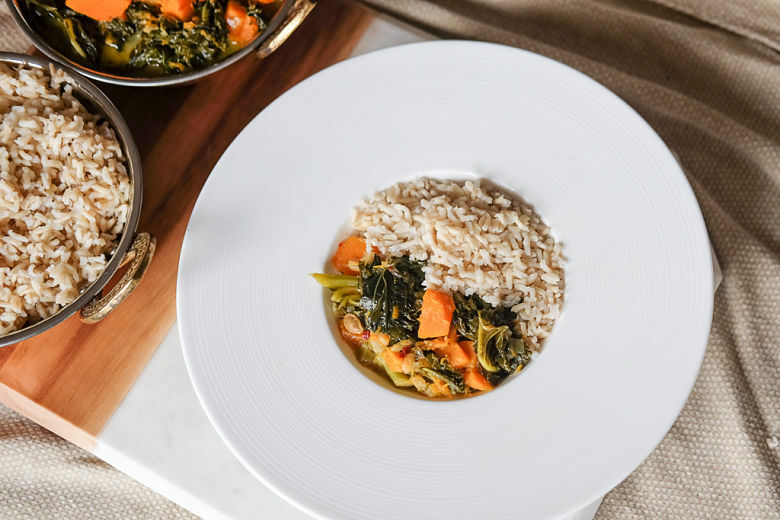 i was looking at the pictures and be look “gosh this plate looks amazing!” I love kale and butternut squash but never thought of having them in a curry! will defo try! This sounds so delicious, also nice and healthy after overindulging during the holidays. I would love to try this. Your presentation of the food looks marvelous! This looks like such a delicious recipe to try out on these snowy cold days! We had our first snow fall over the weekend too!!! Up to 7 or 8 inches in Atlanta which is unheard of! Butternut squash and kale are two of my favorites!! I definitely need to up my cooking game and attempt to make a curry. This looks so delicious for all these cold weather months! That looks so delicious and healthy. It would be perfect for my diet. I really love squash so I will absolutely try this recipe this weekend. This really looks so yummy! I can’t wait to taste this one. It looks so good and delicious recipe indeed! mmm this looks so good. I love butternut squash. Kale’s texture isn’t always my favorite but I would definitely try it this way. I haven’t had many Indian dishes but when I have I have always enjoyed the flavor. I like that you mentioned that when adding the flavors at different times changes the overall finished product. Texture can be hard to get over sometimes. Have you tried roasting it? My favorite rib sticking food is chicken and dumplings. I’ve been seeing more recipes with butternut squash lately. It seems to be quite popular! Do you have a recipe, because that sounds AMAZING. Butter would be great! Typically, in Indian food we don’t really use butter as a fat agent for frying, but I think it would taste really nice! Wow the healthiness of fit all! Coconut is delish & we all know the goodness kale does. This is a great choice.